Hyderabad is a vast city to focus on, so beaming the spotlight on to one of the most growing and popular areas of the city, Malkajgiri. Malkajgiri is situated in the Secunderabad area of Telangana, which in itself is an area of much growth and prominence in recent times. The area is getting its fair dose of businesses entities and is home to a growing new generation of populace. One major factor is the expansion that is currently taking place in and around Malkajgiri, as the government is aiming at better connectivity with better roads, expanded broad enough for connecting important places within Hyederabad and the international airport. Adding to this, more people, especially those who come to Hyderabad in search of work or to shift base are heading to Malkajgiri, aiming to continue their journey stationed there. Here the place is slowly coming to terms with the needs of the people, with more business centres being set up, offices, and residential complexes. With these comes the need to shift their goods like furniture, machinery or valuable items for homes, offices or spaces, the Packing & Moving companies in Hyderabad are going to have a field day fulfilling these requirements. It would be a compelling challenge for these companies helping with the office shifting, domestic shifting, car shifting and needs like these, to help set up the perfect home or office for its consumers. With the modern day boom in businesses, Packing & Moving in Malkajgiri business likewise is on the rise amidst much competition. Although many of these companies might have the professional muscle pull over the market, only a few succeed in transforming their ideal, professional philosophy into their services. Pikkol packer and movers in Hyderabad, is one of them, and is rising at quite a healthy rate, all due to the satisfied customers in and around Hyderabad, who have used and experienced the quality of our packing and moving services. Pikkol have the right professional attitude to carry out these tedious tasks with perfection and acknowledging the demanding needs of their consumer base which makes us the most referred packers and movers service in Hyderabad. Pikkol are known quite well across many small and big localities in Hyderabad, while their professionals are aware of the challenges that lay ahead on the tricky terrain of Hyderabad, especially that in Malkajgiri. 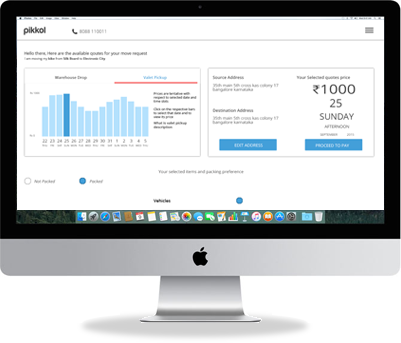 So when in Malkajgiri and in need of shifting offices, domestic shifting, car shifting or relocating businesses, do take a look at what Pikkol is offering, we will help you get a quote on a cost-effective moving solution as well.